This month, we are featuring Aurora Pumps, a multi-billion-dollar company that creates and sells many different styles of pumps. At Kerr, we specialize in these liquid pumps from Aurora. 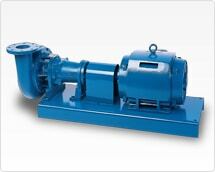 Their Horizontal 410 series are Split Case pumps, and the 340A/360A series are End Suction pumps. The 410 series consists of 3 models. Model 411, is horizontally baseplate mounted with a driver flexibly coupled to the pump. This design is recommended where floor space is readily available and where flooding of the installation is not possible. 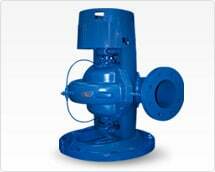 Model 412, is vertically mounted and uses flexible shafting between the driver and the pump. This model is frequently used on difficult applications where flooding of the installation is a possibility. Model 413, is vertically mounted with an elevated driver coupled directly to the pump through a flexible coupling. Model 413 is very popular for installations where available floor space is limited and where possible flooding is marginal. Twin volute on 10” and larger pumps. Single row ball bearing (inboard). Double row ball bearing (outboard). 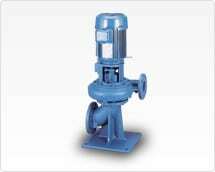 All iron, all bronze or special alloy pump construction. Hardened 440C stainless steel shaft sleeves (packing only). 316 stainless steel shaft sleeves. Oil lubricated ball bearings (Model 411 only). Inline piping arrangement allows piping in any direction. Elevated motor protects against potential flooding if the pump station is in low area. 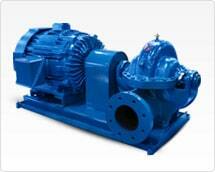 Additional features described for the horizontal pumps are also found in the vertical pumps. The 340 series consists of 3 models. Model 341, is horizontally mounted and close coupled to the motor. Model 342, is vertically mounted on a base elbow and close coupled to the motor. Model 344, is horizontally baseplate mounted with a driver flexibly coupled to the pump. Oil seals and nonsparking neoprene rotating slingers protect both bearings during pump operation and pump wash-down. Mechanical Seal for hot water applications have carbon against ceramic face for optimum performance. Long life is also assured with 303 stainless steel metal parts and Buna-N elastomer. Power Frame (344 series) provides heavy duty maximum interchangeability for flexible coupled applications. Shaft sleeve prevents shaft wear, is slip fit over the shaft, key locked and extends the full length of seal box to eliminate corrosion of the shaft by the pumped liquid. Bearings selected for 3-year minimum life at maximum load, Average bearing life 5x minimum. Grease lube standard. Close Coupled Motors in smaller frame sizes are supported off the motor bracket for maximum rigidity. Case Wearing Ring prevents wear on casing and is easily and inexpensively replaced. Impeller rings are available. Front Case wearing rings are standard on all models and size pumps. Rear case wearing rings are standard only on 2” discharge and larger model 360A series pumps. 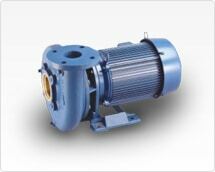 Front impeller wearing rings are optional onall models and size pumps. Rear impeller wearing rings are optional only on 2” discharge and larger model 340A/360A series pumps. Contact Kerr Pump & Supply Sales for more information.